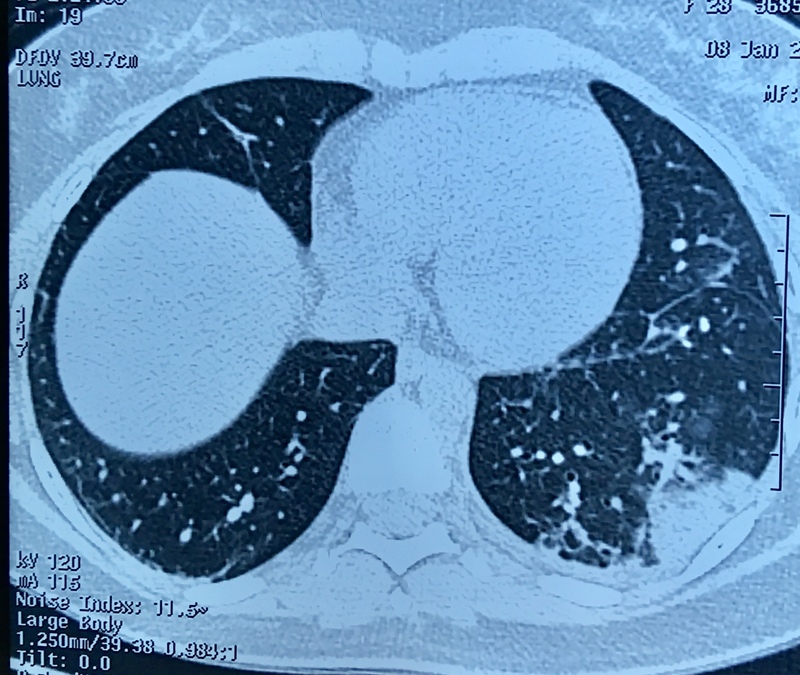 A 28-year-old woman complained of pain in the left hemithorax and light dyspnea in the last two weeks. She reported no fever or sputum production. She was seen in an emergency, and she had been treated with levofloxacin in past seven days, but with no significant improvement. On physical exam, the patient did not appear acutely ill.
Pulse: 96ppm, RR:23 bpm, BP:115x60mmHg, SpO2:96%. Lungs auscultation: Diminished breath sounds in the inferior part of the left hemithorax. How would you describe the radiologic findings? What is the most probable diagnosis in your opinion? Which additional diagnostic tests would you order?